The Goodwood Festival of Speed is back and this year it's bigger than ever, with more than 500 supercars parking up on Lord March’s front lawn. It’s incredible to think that, back in 1993, the Festival of Speed was little more than a garden party, consisting of 12 sports cars and a few hundred people. In 2013, the Festival of Speed will attract 150,000 people and only the British Grand Prix can rival Lord March’s 'party' when it comes to size or grandeur. 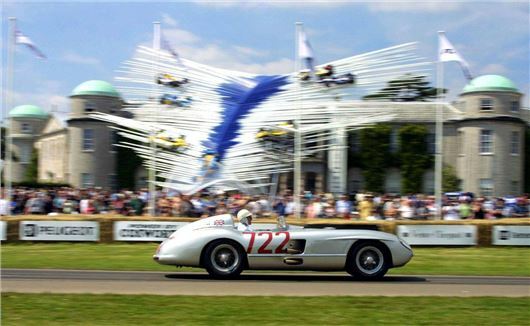 Since the demise of the British Motor Show in 2008, Goodwood has become the UK’s premier launch pad for new vehicles. This year the festival will play host to dozens of new car launches, as the world’s largest manufacturers look to celebrate their histories and promote their latest offerings. Highlights from this year’s schedule include the Alfa Romeo 4C, Peugeot RCZ R, McLaren P1 and the Skoda Octavia vRS. There’ll also be UK firsts for the Maserati Ghbili and the Nissan 370Z Nismo, with the public invited to get behind the wheel of the latest cars in the form of the Moving Motor Show, which will take place on 11 July. There’ll also be some big anniversaries being marked, with the 911’s 50th being the most prominent. Indeed, Lord March has commissioned a colossal Porsche-inspired sculpture to be raised outside Goodwood House and all seven generations of the 911 will be on display, along with a number of Le Mans racers and rare concours champions. Other significant birthdays being marked include 50 years of Lamborghini and McLaren; both manufactures will be demonstrating their latest and greatest supercars, as well as giving a nod to their respective histories with classic collections. This year’s festival also has an impressive runners and riders list, with Lewis Hamilton, Damon Hill, Sir Jackie Stewart and John Surtees all confirmed. There will also be appearances from Alan Prost, Nelson Piquet and Jochen Mass, as former champions roll back the years to get behind the wheel and power up the world famous hill. If that’s not enough, then bear in mind that this year’s event will host its largest ever aviation exhibition, and there'll be special displays from the Avro Vulcan, Eurofighter Typhoon and Red Arrows.